The Daily Man Show: Wye Strainers - Filter the rust deposits before they leave you dry in the shower. Wye Strainers - Filter the rust deposits before they leave you dry in the shower. I haven't posted to my blog in a long time but this particular topic warrants a post. I own an older home whose plumbing is made of cast iron. This is pretty common in old homes. So if you have a home with cast iron pipes then you will know exactly where I am going with this post. 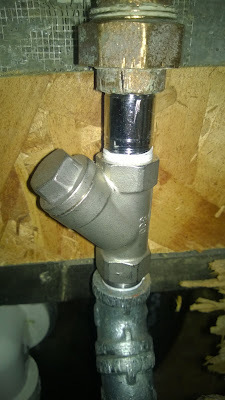 My #1 problem with cast iron piping is that it rusts, and this rust causes all sorts of problems with my faucets and other appliances that use water. 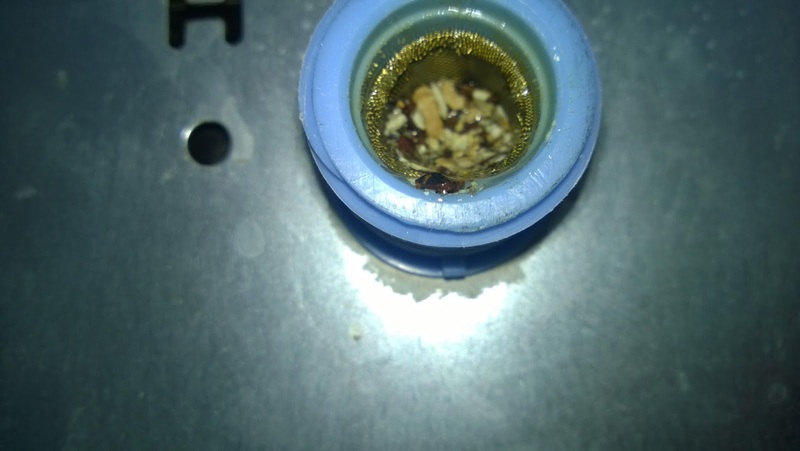 Normally on a faucet there are water aerators with a screen in them that filters out the rust and other debris caused by cast iron pipes, washing machines have a small filter as well. This a my washing machines hot water inlet. You can see it's completely plugged up with rust and other deposits from my pipes. Luckily the filter catches most of it. 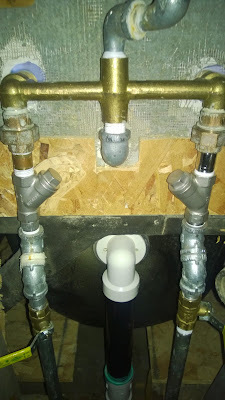 I cleaned out the showers manifold so many times that I installed these brass ball turn valves on my water lines so I didn't have to keep shutting off the water to the house every time I worked on the shower. After tearing apart my showers plumbing one last time and spending some time getting every thing back together I finally have something that I feel will be a long term solution to rust plugging up my showers water faucets manifold. This is what my final project looks like. You can see the inline filter feeds straight into the showers manifold. Now when I notice my showers water pressure decreasing I just have to unscrew the nut on the Y and pull out the filter and shake off the debris. My only regret is that I wish I would have found this solution year a go. TomTom Star Wars Commercials - With TomTom's Star Wars voices, they've come out with some behind the scenes footage that is very funny! Why does it smell like food in here?